When Matthew and Laura first called us, they were planning their wedding and were looking for inspiration for the entertainment. After an initial consultation, we recommended a few acts. Firstly, a gospel choir for the church ceremony. This one wasn’t possible as the particular church near Claridge’s insist on using their own choir, so that option went away and they wisely accepted that it was better to get married in a church close to the venue and so keep the day on schedule! Not to be deterred we moved on to the wedding entertainment for Claridge’s. They were happy with the options we provided and decided they’d like to book a package with us of three different acts for the reception, wedding breakfast and evening dance. The way we work is bespoke. Our clients create their own package with our help and ideas (which are always based on a thorough conversation so we can get to know how you imagine the soundtrack running throughout this huge and special day). 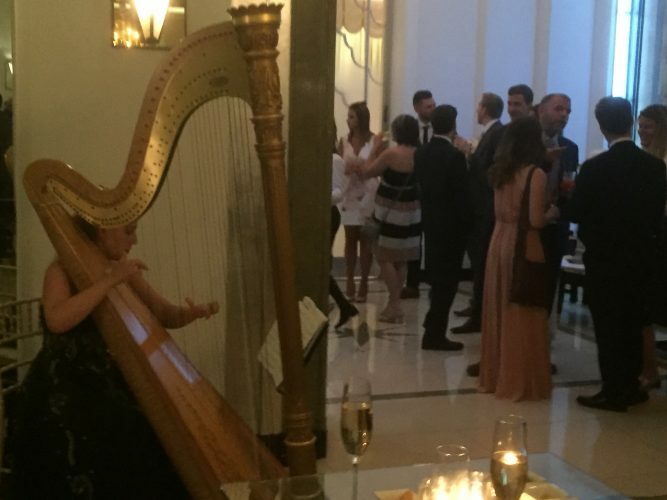 Laura and Matthew chose to have solo harp for the drinks reception as a sophisticated and classy act. For the wedding breakfast, they switched to one of our wedding string quartets. We like to not be a typical classical wedding string quartet. A wedding quartet to some people conjures up images of 4 older classical musicians playing Pachelbel Canon and then a mix of Mozart, Bach and Elgar for a couple of hours. There’s nothing wrong with classical music and indeed we sometimes have clients who only want classical music for the sake of the formality it evokes. However, we think that, like the DJ or band, a mix of music/genres is more likely to appeal. After all, apart from large birthday parties, there aren’t many occasions when there are such a wide range of different ages as a wedding. You can’t please everyone but a nice balance can be achieved. Matthew and Laura chose a good mix of our repertoire and there were lots of classic and contemporary pop songs that were really enjoyed by the couple, their families and friends as they celebrated and dined. Finally after the cutting of the cake, they chose a DJ with live musicians (saxophone and electric violin). The live musicians can help getting the shy up and dancing and it’s fun, interactive and a bit different from a standard wedding DJ. Claridge’s is a great venue in every respect – including live music – with great acoustics and a lot of room for performers and guests. The stunning backdrop is up a level. In case you’ve never been there, go and have a drink in the bar or afternoon tea – it’s amazing! We had a lovely time entertaining and Matthew and Laura were an absolute delight to work with on their own wedding. They enjoyed every moment of it and were so relaxed and happy on the day that the atmosphere was really superb. 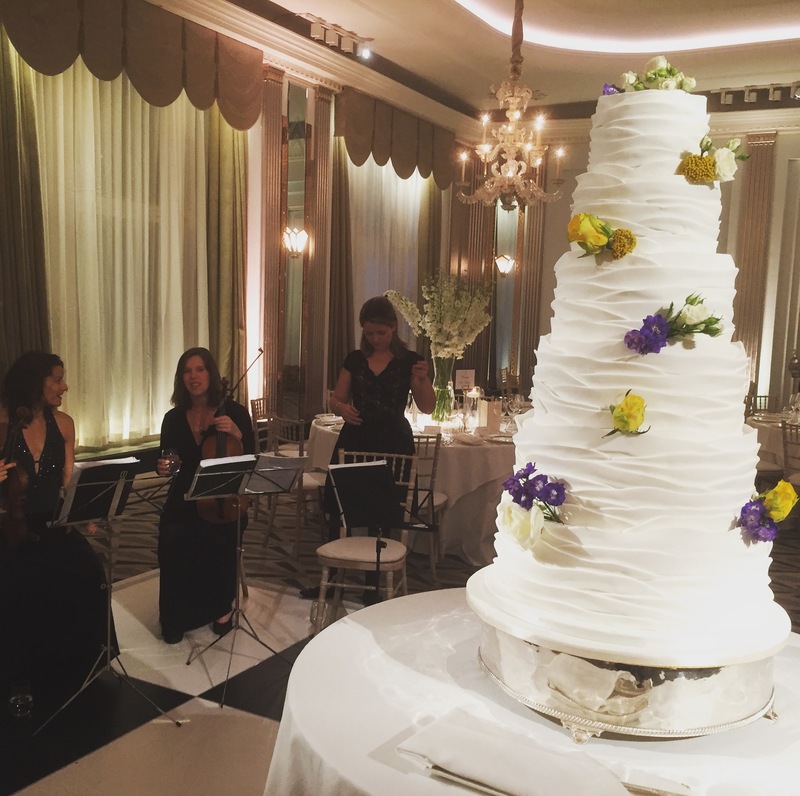 Whether you’re getting married in Claridge’s or somewhere else, contact us to discuss your requirements and we’ll do all we can to make brilliant music for you that will have wonderful associations for years to come.